Ready to perfect your upper cut? This doorway punching bag makes it easier to squeeze in a full-body boxing workout at home. 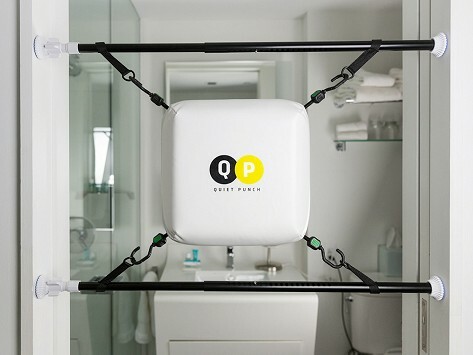 The bag fits into a door frame with tension rods and is quieter than the traditional hanging ones. It can handle your hardest punches without budging. Create your own routine or check out free companion classes online to help get started. Dimensions: 21" x 12" x 6"
Very easy to setup. Strong, and sturdy product. Awesome! Quiet Punch founder Brian Pedone has been boxing since he was 13 years old, and he grew up to run his own boxing gym. He wanted to provide folks with the same full-body workout benefits outside of the ring, so he created a doorway-friendly punching bag as an accessible way to throw punches and work up a sweat without leaving the house. This punching bag is lighter than the typical ones and because there’s no heavy chain clattering, it's quieter, too. Setup is easy, thanks to two tension rods, and there's no need to hold back—this bag was designed with a heavyweight fighter in mind. Not sure where to start? Free workout programs on their website are a good way to cover the basics and hone your skills.